Xena "The Star of South Africa"
Xena was given to us as a gift and what a gift she is. We called her Xena because it means foreigner for the specific reason that she came from the African borders. 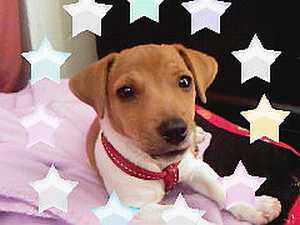 It was like a blessing after our first Jack Russell died from parvo virus. No really she's a bundle of joy after she was about three weeks old she was diagnosed with demodectic mange but with a little help from a 24HR Vet Clinic "24 Hour Emergency Clinic Fisherhill" and Dr Thulani Mthimunye she's all better. And now she only plays, eats and sleeps.